International Journal of Research in Health Sciences,2016,4,1,15-19. Department of Anatomy, Faculty of Basic Medical, Bayero University, Kano, Kano state, PMB 3011, Kano Nigeria. Background: Anthropometry for several decades has been proved to be useful tool for determination of height and other parameters of individual. The study was designed to determine the level of correlation between ear length, width and index for both left and right side of the body. The regression model was provided for prediction of height from ear dimension. The level of accuracy was also determined for each ear dimension. Methods: A total of 219 subjects consisting of 137 males and 82 females were recruited among university students for the study. The height was measured using stadiometer and dimensions (length and width) were taken using transparent graduated ruler. The Pearson correlation and linear regression model were used to establish the relationship and formula for prediction between variables. The percentage accuracy of each formula was calculated as the actual height /predicted height ×100. The data was analysed using SPSS version 16 and P < 0.05 was considered as level of significance. 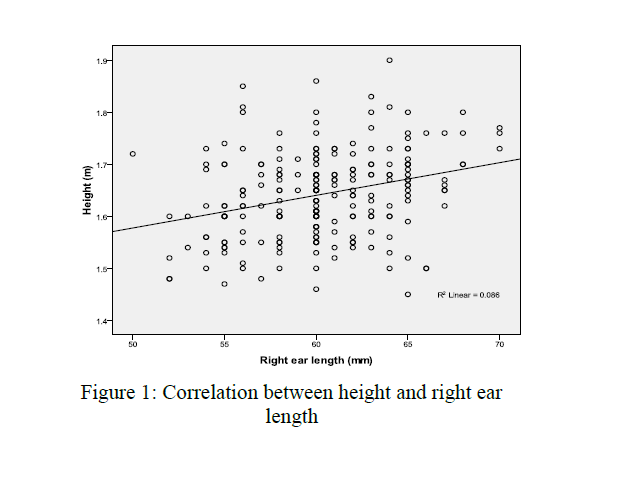 Results: The result shows higher correlation with height in right ear width (r= 0.346, p=0.000) and the least was found in length of ear index (r= 0.090, p>0.05). A linear equation model for prediction of height from given ear dimension was generated. Conclusion: The present study reveals the potential of ear morphometry as an additional tool in the prediction of height form linear ear dimension. The formula favors the female subject more than the male counterpart.